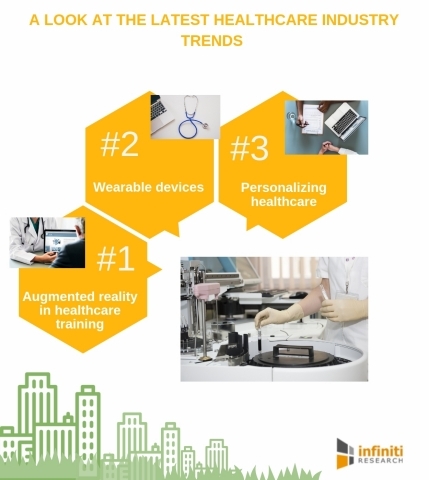 LONDON--(BUSINESS WIRE)-- Infiniti Research, a leading market intelligence company, has announced the completion of their latest article on the latest healthcare industry trends. Despite the recent growth of the healthcare sector, companies must overcome many challenges such as economic recession, increase in uninsured care, and growing competition for outpatient services. They consistently have to make efforts to be in line with the changing healthcare industry trends. In the field of medicine, companies can never rely on the age-old methods to scale up their businesses. They have to enhance their operational services to provide better treatment and patient care. This will require companies to analyze the latest healthcare industry trends that have the potential to transform the sector. “Top medical companies across the world have started to move towards smart technology to improve patients’ comfort and decrease risks,” says a healthcare industry expert from Infiniti Research. Infiniti Research has helped companies with its market intelligence solutions to make smart business decisions. To know how our solutions can scale up your business, Request a free proposal. Augmented reality has a huge potential to train healthcare providers with the necessary skills required for the treatment of patients. By analyzing such healthcare industry trends, professionals can easily diagnose medical procedures in front of them. This will reduce the time doctors spend on reading studies and refine their skills at a professional level. This is one of the healthcare industry trends that can significantly reduce the shortage of trained professionals in the industry. Know how augmented reality can help your organization, Get in touch with our experts. The use of wearable devices has seen a rise as they are becoming popular among masses. Patients prefer to use such devices to track their daily activities and stay healthier. Wearable devices are highly effective in monitoring patient health metrics such as heart rate, blood pressure, and diet. The increased utilization of such wearable devices will compel companies in the healthcare sector to reduce excessive investment in expensive equipment and devices. Consult with our industry experts to gain more insights into Infiniti Research’s solutions for the healthcare industry trends. The availability of data in the healthcare industry has forced healthcare organizations to enhance their services and provide personalized choices to their patients. This involves evaluation of patients' health history and other major health issues. Offering personalized healthcare will help providers to offer the right treatment options, facilitate preventative care, and build credibility in the market. To access the complete list of healthcare industry trends, view the full article here.